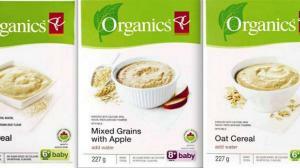 Some Canadian parents are scrambling to check their kitchen cupboards as a result of a nationwide recall of President’s Choice Organics infant cereals. The Canadian Food Inspection Agency and Loblaw Cos. Ltd. warned this week the products shouldn’t be consumed because they may be rancid. The recall was initiated after Loblaw received one report of an illness linked to consumption of the infant cereal. A six-month-old vomited after eating PC Organics rice cereal, according to Julija Hunter, vice-president of public relations at the company. On Thursday, several more parents posted messages on the President’s Choice Facebook page indicating their children became sick after consuming the organic cereals included in the recall. “My baby started using wheat cereal this week and kept projectile vomiting … we assumed it was the wheat and became concerned. This [morning] it all makes sense as we were using this product [included in the recall],” a Facebook user named Corey Wood posted on the site, adding that the company did the right thing by pulling the products off store shelves. While some consumers said the recall wouldn’t change their opinion of PC products, other Facebook users said they were unsettled by the recall and that their confidence in the company was shaken. Eight different types of organic infant cereal are included in the recall, including varieties of rice cereal, wheat cereal and oat cereal. The company, which imports the cereal from a vendor based in Belgium, suspects the rancidity may be the result of one of the raw ingredients breaking down, resulting in a shorter shelf life than the company expected. While it’s unclear what the cause of the odour is or which ingredient may have gone bad, experts say that oils are often to blame when food goes “off.” Oil is susceptible to oxygen, heat and light, which could cause it to break down and turn rancid. Some varieties of the organic cereals involved in the recall contain organic sunflower oil. Ms. Hunter said the Belgium-based vendor specializes in production of infant cereal. The PC Organics infant cereals affected by the recall are the only products the vendor produces for Loblaw, she said. The problem came to the company’s attention last Thursday when the Loblaw received the complaint regarding the six-month-old. The company launched an investigation and although tests were inconclusive, officials decided to conduct a recall of eight types of organic infant cereal. CFIA food safety and recall specialist Garfield Balsom said Loblaw will continue investigating to determine the source of the problem, and that inspectors from the agency would be checking to ensure retailers fully comply with the recall notice. Ms. Hunter said the company received “less than a handful” of complaints about odour in organic products in recent months, but that officials were unable to identify any evidence of a larger problem. In a statement, the CFIA said if the affected baby cereal has been fed to an infant, discontinue use and monitor for symptoms, which could include nausea, vomiting and diarrhea. On the President’s Choice Facebook page, a message to consumers states that products included in the recall can be returned to stores for a full refund, with or without a receipt. For full information on the affected products, visit www.inspection.gc.ca/english/corpaffr/recarapp/2012/20120118e.shtml.